← What a little coffee and laughter will do……. So we found out our court date!!! Hurray. Monday 7/25. So we are now working out the logistics on everything post court date. It is so nice to have this “uncertainity” removed from our lives. As I have said many a time, stress is caused by uncertainity, remove the uncertainity, and you will remove your stress. Want permanent certainity – I can help you find it! Ian enjoying a treat with some of the other kids. We will post more soon. Thanks to everyone for their prayers and support. Amen! Praise God! We’re getting closer!!!!! Thrilled to read this and know that soon this dream will completely come true. Love you guys!!! YAY! So happy you have a court date and can now make some get-home plans. Love this picture. All of these other children live at the orphanage, correct? They all seem so precious, as does Ian. Love Ian’s name, has always been one of my favorite. Will continue to pray that all goes smoothly and you remain peaceful throughout, no matter what. I haven’t been on for awhile so all that I am reading is new to me I was on July 4th time. I was a little surprised you wasn’t home yet. But as I was reading I couldn’t help but what a blessing God is has really given you all this time with Ian one on one and in his country that is helping you to understand him and him getting used to you guys. I know I so see your missing your other babies on the other side of the world and once you go back things will never be the same again you will have a added one. I will continue to pray for wisdom as to what God wants you to do with those 10 days you must wait. One thing I know your other children will really appreciate you now if they didn’t already. They are getting to see just how important mommy and daddy really is in the grand scheme of things. Ian looks very happy and is adjusting very well. I am very excited for you all. Blessed be the Name of the Lord. Praise God. I pray the God will just give you special blessings in the small things while you are there and seek souls out maybe there is someone there that needs saved and the wait is till you figure out who that is whether an adult or a child. You may have one shot and that is the only shot. You don’t know if you will ever go back and will the same people be there? Who knows? In saying that I will pray that God will lead you and guide you and give you that peace that passes all understanding and that he will lead you and guide you and direct your every step. He has a plan in it. This is “Special Time.” He has never had that one on one time I am sure. You all have made memories that will last a Life time. The 1st for everything. And the live changing time you have been able to invest in these children who are in the orphanage they are learning what real LOVE looks like threw your acts of kindness. I promise you they will NEVER forget you I will send a story about a girl that is in USA right now with a hosting program who never forgot the people on a particular mission trip that came to Ukraine 4 yrs. ago never in a million years did she think she would see them again nor them see any of those children again but she never forgot them either and they never forgot them. This was on face book from a friend who has the little girl that this happened too Sunday I just copied the conversations in one made a short article. I was in tears after reading it. I just never knew. I am praying don’t know you but love you and love Ian. God bless will send clippings next to an amazing story. This was a Praise from my very good friend Chastiy Vargas off face book about her Ukrainian HOST child she has in her PA house right now!!! She lives in the middle of now where. The brother and sister that stopped to talk attend the Russian church in State College and invited us all!!! 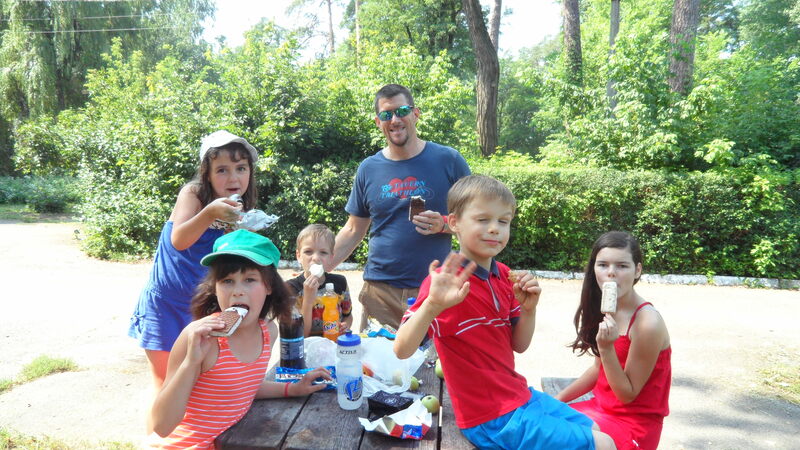 Seriously, in the middle of the woods, on the side of a mountain, God has these two blessings from Ukraine with us, and allows a family from Ukraine to be there at the same moment!!! Love our God!!! We are indeed blessed Anita, Jesus Christ has always ALWAYS proved to supply every need and orchestrate great things!! That was 2 weeks ago this is what happened this SUNDAY July 17 when they went to that Russian church to visit!!! How Big is God again? How Big is God!!!!! I shared how we were hiking on a mountain in the middle of the woods and a young woman and man stopped to ask the girls if they were okay as they were sitting down. I shared that Olena and Zhenya did not speak English, that we are hosting them from orphanages in Ukraine. It turned out that they were brother and sister and spoke Russian and invited us to the Russian Baptist Church…. Yesterday we visited the church and Olena is trying to tell us that she sees people she knows!! Turns out one of the Pastors and a few people from the congregation had been visiting her orphanage and ministering there!!! They had not been to her orphanage in 4 years!! One of the men she had recognized because she had always stayed so close by him I cannot tell you the emotions in all this. I cannot tell you the emotions in all this. Here they are in their church and see a girl they ministered to halfway across the world years ago sitting right there!! And she saw them, and she knew them. We cannot underestimate what our love means to these children … 4 years ago was the last time she saw them and she knew them!!!! And can I remind you that Olena had a different host family and came h…ere once her family was no longer hosting!!! Seriously, reflect for a moment…she was to be in NY but came to this little town, we were on the side of a mountain in the middle of the woods, met this brother and sister that invited us to their church, and at that church was the people that ministered to her when she was younger!!!! Come on!!! If she had gone to NY or if we had not been on the mountain at that time or if the girls had not sat down they probably would have just passed by, GOD IS BIG..if you haven’t believed before let’s talk. Oh Chasity I am filled with awe in this God of yours. I want God to work in my life and my families life like this. Its says the more I seek Him the more I will find HIM i am seeking HIM more now that I ever have. God please reveal your …self to me and my husband and in our lives like this what an amazing story God is so good. Let me just let go and let God this is so inspirational. I wonder what God is going to do? Thank you for you and your husband for just trusting God and doing what he has called you to do and that is bring strangers in your home and take care of the orphans this is amazing. sweet friend. Me – Anne: Since 11:39am I have been pouring my heart out to God in tears of brokenness and desire for God to move in our lives and reveal Himself to us too. I am believing him for a miracle in Kolya’s and his brothers life that is in St Pete and baby Sergio in Siberia, and Baby Emma who is in region 26 with retina cancer. Oh God I need you to move the barriers away and move the mountains and bring our children home in Jesus name. YOu love them more than I do and you have a plan in all this craziness. Thank you Chastity I love you with an everlasting Love and I am believing we serve the same God and He is the same Yesterday Tomorrow and Today.He will do as He has done for you in His way and His time and HIs plan. Trusting Him. Love you thank you for sharing my sweet friend. Anne – I had to read your story over and over – How incredible and humbling that the God of our universe orchestrates a meeting in the woods in the middle of now where!!! It made my day reading it! BTW – I know where the “middle of no where” is – I grew up near State College as well and it is indeed called “God’s Country”! I love going home in the summers! That is too funny how you all know where this place is my friend said its about an Hr away from her. The church its self is 40 minutes from her and those people that was in the woods was 40 minutes from the church in another direction so technically if you added both ways it would be 80 minutes away from the peoples house the ones that spoke Russian. How Amazing is that. I am still boggled about the whole thing I talk to my friend Chastity today she said there was 100s of people it wasnt a small church. and little girl was trying to tell them that she knew some of these people? Amazing when they indeed went up they all knew her by name and the tears was flying even the one who she stayed so close to that weekend it was a Happy Day in the House of the Lord. They will continue to go there with the children because we all Know Salvation is the most important gift you can offer a child. Salvation is free and it will impact them for a life time. I am glad it encouraged you I sensed the Lords leading to share so I knew he was all on it to share. I am so glad you was blessed. I love your little boy as so many other we have all labored in prayer over this little guy and feel sense of attachment to him and we are ready for him to be home and hit the USA soil in Jesus name. But as I have said God has a purpose for you extended stay. You are very blessed to have so many people taking care of your children and knowing they are in very good hands that is a blessing right there. I know what has happened in your situation you have been blessed and highly favored and Just Gods timing for little Ian. We have been working on a difficult adoption since finding him threw this same hosting program Chastity is with since last Oct. He is not even on the registry his momma died 2 yrs ago have found he has a brother who is 8 same age as Ian. They haven’t seen each other since the separation dads right terminated NOV10. We have found they will be adoptable in Nov. We are the only ones that can adopt ours due to he was a last chance child at age 16 they are kicked out if they have a 9th grade education well we are praising God he is only at 8th so he is still there. But we didnt know this at the time so we worked hard on our own to get paper work in. We had no agency helping at all they said to much of a risk. SO I said all this to say we have seen our own miracle and we are expecting God to move these mountains for us. The mountains you had were huge Ian had no time it was a NOW thing or he was going to live a life we all don’t want to even imagine. I agree with the verse the lady sent you the other day. Do not grow weary in well doing for you will reap a harvest in due time. Don’t even think about the money where God leads he will provide and you cant put a price on a soul or any of the souls you interacting down there in this time. God bless and praying excited about the court just not to much longer. I have another friend who got stuck down there for a long time but she says having what she has now it was worth every time spent she has a last chance child as well from Eastern Europe same hosting program the other children come from. She was there 7 weeks. Doing a very ungraceful happy dance in your honor! Whoo-hoo! Tonight at prayer service we prayed for you (McKenna started us out)! So excited to come home and read that God has answered!!! Love to you all. I’m just in love with you guys and with Ian. I’ll be praying for y’all! Much love! I am praying for your family!! I hope everything goes smoothly! !